On Friday, I spent much of the afternoon listening to the funeral service for Muhammed Ali that took place his hometown of Louisville, Kentucky on June 10. One reporter said that she was concerned that the driver of the hearse carrying Ali’s body might not be able to see, given the massive volume of flowers thrown onto it by thronged onlookers along the nine-mile procession route. I went to the beach in the afternoon after I got out of work, and sat meditating on the sand, feeling the pull and relax of the waves, and the tangling dynamics of complex tides. 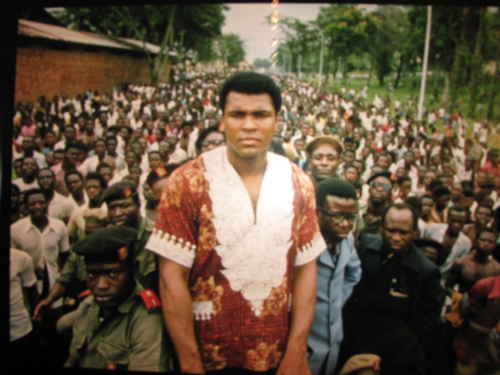 On the way to and from the beach, I listened to the many eulogies, and reflected on what a perfect combination of militancy and humor Ali had employed in his activism, and on what a fearless humanitarian he had been. Muhammed Ali’s famous discipline comes to mind. He said, “I hated every minute of training, but I said, ‘Don’t quit. Suffer now and live the rest of your life as a champion.” It’s not like he just woke up one day to be one of the greatest boxers and human beings in the world—he understood that commitment is a decision that happens every day, sometimes in every moment. He also said, “I am an ordinary man who worked hard to develop the talent I was given. I believed in myself, and I believe in the goodness of others.” I am not trying to be a champion 5Rhythms dancer, but I am deeply inspired by Ali’s integrity and by his commitment to his practice. Arriving, I was nervous about several mild injuries and wrapped my knee with an ace bandage from the medical kit. I was surprised to find the binding very effective, and that no persistent injury presented during the course of the class. During the first wave, Kierra offered almost no instructions; and the dance unfolded patiently. Near the end of the first wave in the rhythm of Lyrical, I partnered with a friend who I love to dance with. The night before, I had been to a Taikoza concert—a kind of theatrical, Japanese folk drumming that totally captivated my small son and his friends. The influence presented strongly in this partnership. We leapt and bound, with theatrical pauses, strong eye contact, and bursting, spinning gestures. At moments, we moved as though we were in ceremonial costume, twittering, with big, fanned-out bustles and high, sharp collars. In our closing gesture we looked into each other’s eyes, each spun quickly one at a time, then returned to eye contact. Then we both bowed, smiling, and moved on to different parts of the room. In the interlude between the first and the second waves that often features verbal teaching, Kierra asked if there was anyone in attendance who was doing the 5Rhythms for the first time. Three or four people raised their hands in response. She said that she would talk about the practice of 5Rhythms first, explaining what we actually do, then she would talk briefly about the philosophy of 5Rhythms. To paraphrase, she said that in the first of the five rhythms—Flowing—we drop down into our feet. We can be Flowing in our arms and upper body, too, but if we do that we tend to stay “in the head.” The reason we drop into our feet, keeping them in continuous motion, is so we can become fully embodied. She then said that the second rhythm—Staccato—is the opposite of Flowing. It is directional, angular and specific. In Chaos, we let it go, then in Lyrical, we let go of the letting go—lightening up. We move into our hands and arms, (which are considered to be the messengers of the heart in many cultures). In Stillness, we are still moving, it is just that we are moving with still energy. One person’s Stillness might be Flowing Stillness, another’s might be Staccato Stillness, another’s Lyrical Stillness, but it is all moving with that still energy. During the entire litany, Kierra moved as she spoke, demonstrating what each rhythm looked like for her in that moment. Kierra said something curious about partnering that I have been contemplating. Speaking about how the ability to sink into the wisdom of the body is central to 5Rhythms practice, Kierra said, “Sometimes we partner or we dance in a group, and it’s OK to be social, but the point is really to find the body’s wisdom.” I’m not sure if part of what she was expressing was that partnering can be interesting, but that the true practice happens on your own, or if I read into her remark, but it gave me a jumping off point for consideration. It occurs to me that relationship is the arena of ego, and that it makes sense that in relationship could be the most productive place to work with ego. A dancer—someone I have spent hundreds of hours in sublime, moving partnership with—appeared shortly before Kierra’s talk. As soon as our paths crossed, I jumped enthusiastically into his field and began to bound and leap. I remembered that the last time I had danced with him, I had completely overdone it, injuring my back and suffering for days. I reminded myself that I had to be gentle or I would pay for it later. For years, he and I met in enthusiastic and athletic Chaos and Staccato. On this day, the refrain in our dance was an enlivened and energetic Stillness, a thread woven through all the rhythms, that we kept dropping back into. We fully embraced Kierra’s wonderful goofiness invitation, even vocalizing and making absurd faces, falling to the ground and tumbling, then rolling back up—sometimes with one of us on the ground and the other upright, still engaged in a related gesture, arcing and playing around the other’s field. At certain points in our dances, all activities of selfing ceased completely; and I moved simply in the energetic field. In our final turn of the evening, I experienced myself in what I understand as the Body of Joy, visibly surrounded by light in the shape of my body. I dispensed with all armor and energetic defenses and my field intersected with my partner’s and with the people in close proximity. Re-reading this text, I realize I am struggling to express the depth of my admiration for Muhammed Ali, and to express why he is so important to me, personally. It is not only Ali’s words and actions that touch me, but that the world, despite its continued brutality and racism, loved and still loves Ali—saw his genius and his beauty and his power—gives me hope for humanity. Gives me hope for all of us. Thank you, Muhammed Ali, for believing in yourself, for believing in the basic goodness inherent in all human beings, and for your tireless generosity in the face of a world that could not get enough of you.